That is how it always begins. There is an outbreak out there, somewhere, away in a place that is safely distant. If we care at all it is because we know the place and some of its people. Perhaps we have business with them. And, too, we care because the diseases affecting those distant places sometimes have traveled from out “there” to our “here.” That was certainly true for Defoe’s narrator, whose hopes that plague would not migrate to London were shattered in December of 1665 when the British Bill of Mortality listed “Two Men, said to be French-men, [who] died of the Plague in Long Acre, or rather at the End of Drury Lane.” The family in whose house they boarded attempted to conceal the disease (they didn’t want to be quarantined) and therefore delayed its reportage. By January, plague had taken hold in two London parishes. Over the next weeks and months the death toll climbed. Once again, plague had spread across London. Defoe was four years old during the pandemic of 1665. Some scholars say he relied for his narrative on a later epidemic outbreak in France. Others suggest that the Journal was grounded in an oral history of a favored uncle who lived through and survived plague’s 1665 visitation. We have as well the report of the great diarist Samuel Pepys who, like Defoe’s narrator, had heard the early rumors of plague in Amsterdam. Pepys’s 1665 journal reported on the epidemic. Even when those he knew, or their family members, were dying, Pepys refused to leave the city with other government officials. He chose instead to continue working, observing, and fortunately for us, writing. These and other historical reports have much to teach us about the nature of modern epidemic and pandemic diseases. Plague was a recurring nightmare and in its repeated visitations killed thousands of people every decade or so. Seventeenth-century officials understood much about its dynamics. 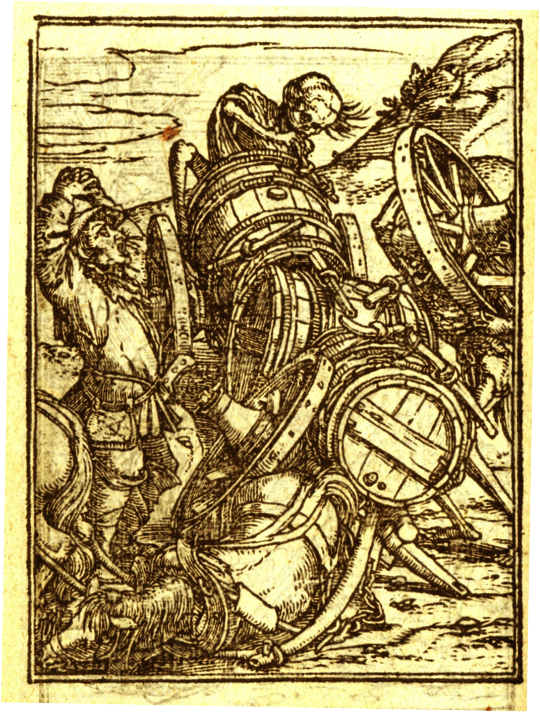 In 1538, Johan Froben published Hans Holbein’s Dance of Death in which Death rides in the cargo holds of sailing ships when he’s not sitting on the ox-carts of land-based travelers. Nobody knew what plague was, exactly. None doubted that it was dynamic and progressive, a “here-to-there” kind of thing. If it was in Amsterdam or Rotterdam it therefore likely would come to London if quarantine measures were unsuccessful. In Holbein’s famous “Dance of Death” he shows death, infectious disease, as something spread by travelers and their goods. In the days before newspapers and international reportage, confirmation of those distant rumors was difficult. But once plague arrived in London the situation changed. Month by month the Bills of Mortality listed the accumulating deaths in the city’s parishes. It was impossible not to notice the carts that carried the dead from their homes on which the mark of quarantine had been painted on the door. Visible too, if one had the gumption, were the burial pits of victims. Defoe, Journal of the Plague Year, 65-66. If we are honest with ourselves, the current Ebola epidemic—a virus that strives toward pandemic status—is not too different from those earlier, bacterial visitations. Just as the rumors of plague in Amsterdam were a source of interest but not undo unease in 1665, nobody paid much attention to the report of seven ebola-related deaths in Uganda in December, 2012. Nor did the 36 mortal cases in the Republic of Congo raise serious international concerns. Even in March, 2014, when fatalities were reported in Guinea, international health officials paid only casual notice: “It took more than six months after the outbreak was identified before WHO … released its Ebola virus Outbreak Response Plan.” It was not until late in the summer of 2014—with outbreaks in Liberia, Sierra Leon, Nigeria and Uganda—that the U.S. Centers for Disease control issued advisories warning travelers to stay away from the countries where this new plague was active. Defoe, Journal of the Plague Year, 86. Just as Defoe’s index case was in a home whose residents attempted to hide the fact of plague, in Monrovia, Liberia, “Many sick people have hidden in their homes, relatives have sometimes taken their loved ones away from health centers.” Nobody wanted the stigma of confinement. And who could blame them? As it was in Defoe’s day, people needed to go to the market for provisions and to get water for their homes. And, too, “treatment” centers offered little hope of either treatment or relief. As the disparate Ebola outbreaks worsened, evolving into an epidemic that spread to other countries, health officials struggled to track the travels of persons from infected countries, to put the genie back in the bottle. All it took was one infected but asymptomatic (or mildly symptomatic) traveler to carry the disease from there to here. Like other epidemic creatures, Ebola can spread geometrically through interpersonal contact and one traveler can infect the many in new countries, new cities and distant homes. It was not until August of 2014 that international airlines unilaterally curtailed flights into affected countries where the epidemic was well entrenched. The greater international community watched with trepidation: would the epidemic expand its geography into pandemic status? Like the worried Londoners of Defoe’s time, distant peoples worried for themselves while, in affected areas, shortages of food, medicine and local policing made both civil order and disease containment difficult. “It’s like wartime,” the president of Médicines sans Frontières, Dr. Joanne Liu, declared in a statement on Ebola on August 14. It’s not “like” wartime. It is war. To combat the expanding bacterium or an advancing, viral incursion has always required military style thinking. To survive, a microbe requires potential hosts who can be effected just as invading armies require supplies if they are to advance. To tame a microbial incursion requires containment procedures that will deny it new hosts, new supplies. 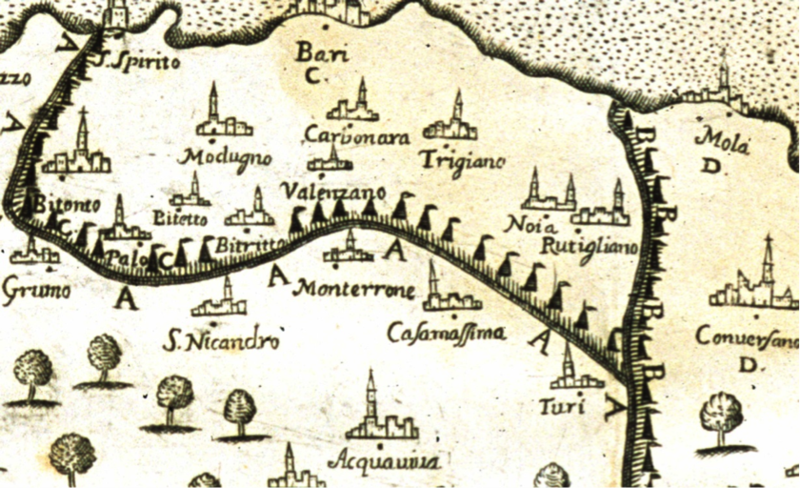 In 1694 Bari, Italy administrator Fillipo Arrieta published two maps that carefully detailed a multi-stage containment plan designed to limit plague incursions in Bari, Italy. Perhaps the best, most complete description of a military-style response to epidemic incursion was written in 1694 by Fillip Arrieta, royal auditor for the province of Bari, Italy. During the plague years of 1690 to 1692, Arrieta instituted a detailed and sophisticated quarantine, surveillance and support program for affected cities. Using thousands of troops, his plan of attack was summarized in two maps that survive in a rare edition of his report, today shelved in the rare books room of the New York Academy of Medicine. Intuitively, Arrieta understood that there are two complementary spatial strategies that, correctly employed, can stop the progress of a contagious disease while maintaining order in affected cities. The first was a defensive cordon sanitairé prohibiting travelers from affected areas from entering regions free of the disease. The second was what medical geographer Peter Haggett has called “offensive isolation” in which infected areas are isolated from their disease-free neighbors. Either way, the goal was simple: cut the microbe’s food chain by depriving it of new hosts. Arrieta mapped an 80 kilometer-long defensive cordon to separate Bari from its neighboring provinces. 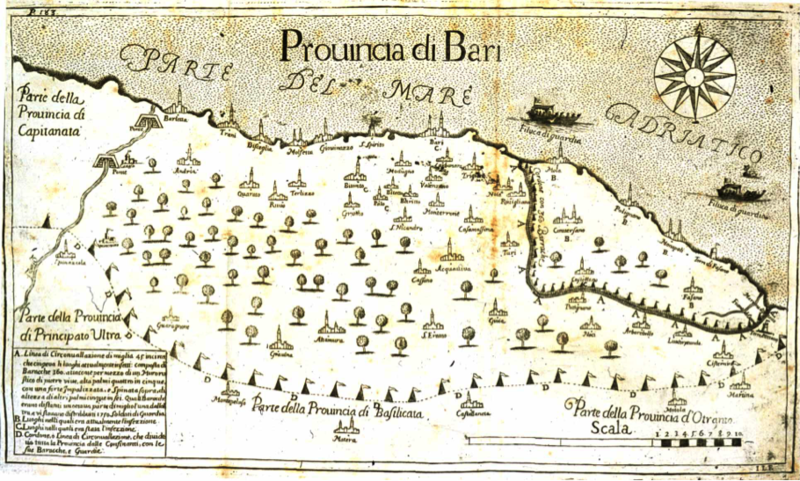 In the map the containment field is symbolized by a dotted line and flags, each representing the position of a military post where soldiers were ordered to prevent travel in or out of Bari Province. Along the coast are “feluccas de guardia,” vessels similarly charged with prohibiting sea trade or travel. The goal was two-fold: first, to prevent the introduction of new plague strains from other areas and, second, to attempt to halt the transmission of plague from Bari to neighboring jurisdictions. In addition, Arrieta created secondary levels of containment around the area of greatest plague activity. The walled area in the map’s northeast, with a dense compliment of troop flags marking the location of military encampments, provided a secondary level of containment in the most affected region of the province. In the maps (there were two) different letters placed beside a town distinguished those where plague was active, where it had been active, and those that remained plague free. Within the general cordon sanitairè Arrieta created a second manned-cordon which provided offensive and defensive containment as needed among the towns where plague had been, or was active. In effect, Arrieta created a thoroughly modern multi-tier program of containment that isolated Bari from its neighbors, and in Bari, areas of contagion from areas where plague had yet to arrive. In addition, his program included services for citizens in the affected areas. The churches and town halls that symbolized cities on the map also stood for facilities that provided hospice care for citizens within the containment areas. The report in which the maps are lodged, carefully detailed the necessities of the affected towns and the means by which his army maintained order and supplies. The basic proposition of the map was simple: if human trade and travel are the vehicles of epidemic plague, then to defeat the disease, trade and travel must be contained. Underlying that proposition was an ethical imperative which his report made clear: if plague is a threat to the citizens of Bari, it is the government’s responsibility to do all it can to contain its reach while maintaining the lives of citizens in the cities. Underlying this proposition was a morality declaring royal responsibility for the lives of the people. As royal auditor, it was Arrieta’s duty to do everything possible, therefore, to both battle plague’s incursion and provide for citizens in affected areas. The report in which his maps are lodged, today explain the cost of his efforts in military deployment and lost revenues as a royal necessity. Arrieta’s approach has been rarely equaled in subsequent centuries, despite frequent and recurrent epidemic outbreaks and pandemic visitations. In the eighteenth century, the disease was yellow fever and the question was whether, like plague, it was traveling in merchant ships or, as some believed, locally generated in unsanitary streets where refuse piled high. If it was a trade-born traveler then the necessary response would be quarantine and trade restrictions. But if, as medical opinion then insisted, it was instead locally generated in the unsanitary, odiferous sewage of affected cities, then the response would be sanitarian. Public cleanliness, not containment, was the preferred answer. In the nineteenth century, the disease was cholera and here again the question was whether or not to quarantine ships and travelers from affected areas. Attempts by British officials to institute quarantine measures against non-British ships in 1831 when cholera was rampant in Europe, were denounced by authors in The Lancet as a “savage” imposition on trade. It was not that trade had become important in the nineteenth century in a way that it was not in earlier centuries. The necessities of international trade had long dominated the economies and industries of European nations, and later, American nations as well. Rather, with cholera The Lancet authors, while agreeing that human trade and travel was the likely transmission vector, insisted the epidemic would be preferable to a restraint of trade and the revenues it provided. The physician’s responsibility for the health of citizens, and that of the government of the day, was secondary. They recommended urban sanitation be improved and charity be invoked for those who would be affected by cholera’s infection in Great Britain. In subsequent years, when new epidemics threatened, their rapidity was such that few knew how to institute a timely quarantine program. Programs designed for bacterial incursions were not particularly successful when faced with rapidly diffusing, viral diseases. The 1918 influenza epidemic born in North America, was so rapid in its spread that quarantine seemed futile. From its origin, the vector of transmission was Allied troops who infected civilians on the return to their home countries. Only Australia was sufficiently distant to be able to affect a quarantine program because the sailing time from Europe and the Americas assured any infected person upon departure would either be recovering or dead upon the time of their arrival. Poliomyelitis, first reported in the 1880’s in Europe, returned periodically until the last pandemic in the 1950’s. In North America local programs of containment — the short-term quarantine of affected families — were ineffective. Nothing seemed to work until, in the 1950’s, Sabin and Salk vaccines permitted the long-term protection of susceptible populations. It was not until the 2002-2004 SARS (Severe Acute Respiratory Syndrome) outbreak that issues of contagion were raised again. There were neither royal imperatives insisting upon organized care programs or containment protocols, only voluntary programs that saw travelers, worried about infection, changed their plans. 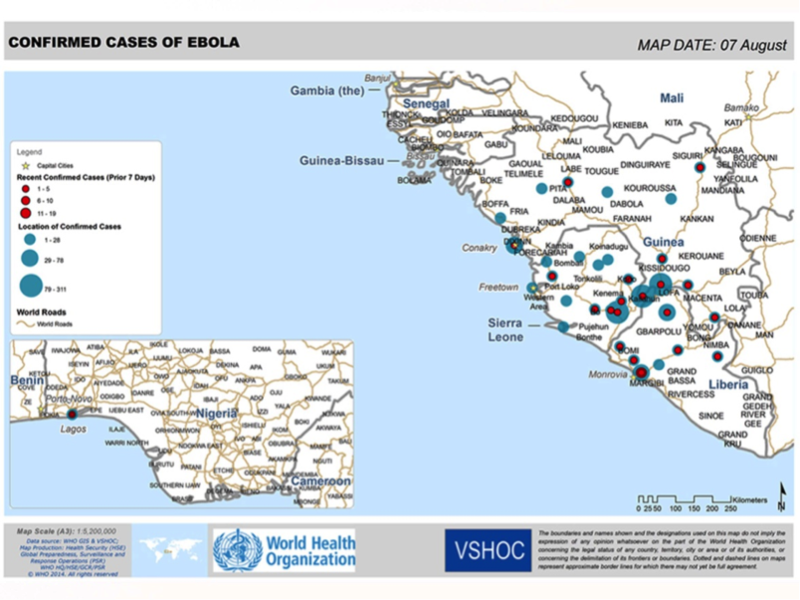 Consider Figure 5, the World Health Organization (WHO) map of Ebola in August 2014. The map naturalizes the incidence of Ebola across the time of its recent outbreak. Red dots show recently confirmed cases and larger blue circles symbolize all locations in which Ebola has been reported. Larger blue circles with red dots at their center identify cities where recent Ebola activities occurred in areas where it had been previously reported. The 2014 map of Ebola naturalizes the epidemic as a West African event. It does so without comment on causal elements, the necessities of treatment for those affected or the means by which its spread could be contained. The map’s proposition is ethically and practically neutral. The map argues neither for containment nor measures—natural or international—for disease treatment. But why map Ebola at all? The ethical imperative to care that underlay Arrieta’s mapped approach to plague is largely absent today. There is no central government or organization to restrict travel and trade while providing care when a bacterium or virus goes, “viral”. We cede concern and control to local agencies and officials until the epidemic threatens others, and especially us. The map is therefore agnostic on the need for either local treatment or smaller scale (national or international) containment strategies. After all, the WHO does not have troops at its disposal to create and enforce a system of quarantine like Arrieta’s. It does not maintain battalions of doctors and nurses who can enter an area where epidemics threaten to curtail an epidemic outbreak before it begins. It cannot even insist that member nations follow established protocols although, certainly, it can recommend them. Nor can it, in the manner of the 13th century Venetians who coined the word, insist upon quarantine procedures. It is one of the ironies of modern globalization that responsibility is left to individual states, and of course, to corporations. Sounding very much like The Lancet authors writing about cholera, Gregory Hartl, a spokesperson for the W.H.O told reporters, “the best way to stop this outbreak is to put the necessary measures in place at the source of infection.” But “at the source of infection” are poor countries which lack the resources to combat the infection that overwhelmed them. Mapping serves not only to detail campaigns to contain disease when it occurs but, as importantly, to seek the environments that serve as disease incubators. What are the origins of Ebola in Africa or, by extension, any of the recent epidemic states that have threatened pandemic status: influenza strains from China or Mexico, MERS from the Middle East, West Nile Virus, etc? We are in a period of rapid microbial evolution and outbreaks begin in poor countries — or poor regions of rich countries — and then spread. What is going on and how can we understand it? Bacterial and viral evolutions are always encouraged by a well-understood set of conditions. These include urbanization in a context of accompanying deforestation that disturbs traditional ecologies. With urbanization typically comes poverty—and income inequality—the result of which is the aggregation of vast groups of immune-suppressed persons in densely-settled but poorly-maintained cities. These in turn provide an ideal environment for the evolution of microbes displaced by urbanization, deforestation and changes in traditional patterns of agricultural production. All this occurs in the context of local, regional, national travel and trade that assure new vectors for evolving microbial strains. The constituents contributing to the evolution of Ebola and its maturation from rare outbreak to epidemic status can all be mapped. These include rates of deforestation, urbanization, levels of local sanitation and income inequality. At a more sophisticated level, the relation between overfishing of African waters and the increased use of bush meat as a dietary staple, one factor implicated in Ebola’s development, could be similarly mapped. This would serve to create an index by which the likely sources of bacterial and viral evolutionary conditions could be predicted. It would also impose an ethical yardstick on the societies-local and global—that permit these conditions to exist. And, of course, in the event of an epidemic—this one or the next—maps may serve to describe (as Arrieta’s maps did) programs of containment and care. As Daniel Defoe knew, quarantine will not serve if there is no food or medical service for affected populations. We know how to develop a comprehensive response to infectious disease. Maps of plague, yellow fever, cholera, influenza, etc. provide us with templates for advance planning and en media res, necessary actions. We lack, however, international bodies to engage them, and the national will to participate in them. What we lost in the nineteenth century was a sense of the state’s responsibility at all levels for care and containment, irrespective of cost. Strangely, perhaps, we lost a sense of the global nature of epidemic disease and thus the need for global responses. And so, today, we are technically more adept, scientifically wiser, but ethically and politically less able to respond to disease emergencies whose course can be mapped, whose origins can be located, but whose response requires a kind of will we seem to have lost. Tom Koch is a medical ethicist and geographer and the author of Cartographies of Disease (2005) and Disease Maps: Epidemics on the Ground (2011). Feature image: Ian Mackay, virologydownunder.blogspot.com.au.
. Daniel Defoe, A Journal of the Plague Year, &C (Norwalk, CT: Heritage Press/ 1665/1968), 1. Samuel Pepys, The Diary of Samuel Pepys http://www.pepysdiary.com/ (Accessed August 25, 2014). Claire Tomalin, Samuel Pepys: The Unequalled Self (NY: Viking Press, 2002) 168-178. Hans Holbein, Dance of Death (London and New York: G. Bell & Sons, 1894) https://archive.org/details/danceofdeath00holb (Accessed August 24, 2014).
. CDC (Centers for Disease control), Ebola Outbreaks 2000-2014 http://www.cdc.gov/vhf/ebola/resources/outbreaks.html (Accessed August 24, 2014).
. Keith Martin, “International community’s slow response to Ebola costing lives,” Toronto (Canada) Star, September 10, 2014. http://www.thestar.com/opinion/commentary/2014/09/10/international_communitys_slow_response_to_ebola_costing_lives.html (Accessed September 16, 2014).
. Jonathan Paye-Layleh and John Heiprin, “workers treated with untested Ebola drug show ‘remarkable recovery,” Associated Press/Toronto Star, August 19, 2014 http://www.thestar.com/news/world/2014/08/19/workers_treated_with_untested_ebola_drug_show_remarkable_recovery.html (Accessed August 19, 2014). Lizzie Parry, Emmay Glandfield, and Mario Ledwith, “How deadly Ebola has spread across the globe: Health officials try to trace 30,000 linked to death of American victim,” Daily Mail Online, August 25, 2014) http://www.dailymail.co.uk/news/article-2710285/Ebola-test-feverish-man-flew-Britain-West-Africa-doctors-red-alert-deadly-virus.html (Accessed August 25, 2014).
. Jonathan Paye-Layleh And John Heilprin, “Workers treated with untested Ebola drug show ‘remarkable’ recovery,” Toronto Star (Associated Press), August 19, 2014 http://www.thestar.com/news/world/2014/08/19/workers_treated_with_untested_ebola_drug_show_remarkable_recovery.html (Accessed August 28, 2014). “Ebola Epidemic is “like war time, Says MSF,” Sky News, August 14, 2014 http://news.sky.com/story/1319044/ebola-epidemic-is-like-war-time-says-msf (Accessed August 22, 2014).
. Fillipo Arrieta, Raggualio historic del contagio ocurso della provincia de Bari negli Anni 1690, 1691, e 1692 (Napoli: Dom. Ant. Parrino e Mcihele Luigi Mutti, 1694).
. Peter Haggett, The Geographical Structure of Epidemics (Osford: Claredon Press, 2000), Chapter 4.
. Max Fisher, “Major Shipping Routes in the colonial era,” 40 more maps that changed the world, Washington Post (January 13, 2014), http://www.washingtonpost.com/blogs/worldviews/wp/2014/01/13/40-more-maps-that-explain-the-world/ (Accessed August 28, 2014. Gwynn Guilford and David Yanofsky, “Here are the 35 countries one flight away from Ebola-affected countries,” Quartz Magazine, July 30, 2014 http://qz.com/242388/here-are-all-the-35-countries-one-flight-away-from-ebola-affected-countries/ (Accessed August 31, 2014).
. Brashares, J.S. Arcese, P. Moses K. Sam, M. K, Et al. Bushmeat Hunting, Wildlife Declines, and Fish Supply in West Africa Science 2004; 306: 1180-1183. The recent outbreak of Ebola in Guinea, Sierra Leone, Uganda, Liberia and Nigeria is terrifying. Ebola is frequently fatal and poorly understood by most people. Even though Ebola is only “transmitted by direct contact with body fluids of a person who has symptoms of the Ebola disease ” it has spread quickly and widely through these countries. Additionally, this outbreak have been remarkably persistent. While it would be much more difficult for an Ebola outbreak to spread like this in the United States or Europe, the difficult conditions and undeveloped health care system in West Africa have made it possible for Ebola to thrive. Please read Koch’s timely and fascinating post. I hope we contain this Ebola and that any containment issues tried help curb it. Right? Thanks for this inspiring blog. The social dislocation in Africa has led to many communities worldwide being home to refugees. Often rural or regional. The boundaries of the containment map widen. Should it be treated like the movie: 28 weeks later? Good summary and research links. This piece is thought provoking. Am I not glad I came across it? I believe, like President Obama, that the Ebola scourge is one of the “symptoms of a broader problem – the failure of our international system to keep pace with an interconnected world.” The UN have failed to adequately invest in the public health capacity of developing countries. The most recent outbreak of the Ebola scourge reflect the failure of the international system to SEE the scourge as global health threat, rather than an African epidemic. Reblogged this on beeutifulbliss's Blog. Este excelente artículo explica cómo la historia de las epidemias nos ayuda a comprender qué estamos haciendo mal y por qué en el siglo XXI no somos capaces de contenerlas. La globalización y la prioridad dada al poder económico sobre el interés general de la población y el derecho a la salud tienen un papel relevante en este fracaso según su argumentación. También explica brevemente la relación entre los equilibrios ecológicos, la sanidad ambiental y la aparición de epidemias. Le dedicaremos otra entrada a este tema en el que traduciré estos párrafos tan interesantes. Let’s be honest, Ebola is a horrific disease but the much mass media mania over the outbreaks is fear mongering. The facts are many Africans in places like Liberia; Sudan or Uganda and these regions of the world are 6x more likely to die from Malaria than from Ebola. So I ask what’s the real agenda here? What is the smoke screen of sending 3k American troops for over an Ebola epidemic? How is this really an epidemic when a million may die from Malaria; yet, no travel arrangements from these regions are shutdown or have been despite the risks and facts that billions are risk for contracting Malaria. Though I’m following the ebola outbreak and don’t really suspect there is a “real agenda” (if by that we mean something nefarious) that is motivating assistance from outside of Africa, I completely share the concern about ongoing medical crises not receiving sufficient concern. More than a million Americans have AIDS; 35 million have AIDS worldwide; almost 3.5 million are children. (for the global stats: http://www.aids.gov/federal-resources/around-the-world/global-aids-overview/) I think we sometimes don’t realize how much IS being done to address crises like AIDS, but we pay far too little attention diseases like malaria, I agree. Tom (and anyone else), below is a link to something I wrote recently. I would be more than grateful if you care to offer any feedback. Thank you for the thoughtful piece. Ebola has existed for many years. The epidemic for some time disappears. This means it is possible in some way to eliminate it completely. True and scary! Hopefully they will figure out a way to care enough to stop this. Thank you all for your comments. A quick note to dgerden. Ebola was first identified in 1976 so, yes, it’s been around for a while. There have been isolated, largely rural outbreaks limited to distanced communities. What makes this different, an epidemic, is that it occurs in a larger population in towns which has permitted it to expand regionally. Outbreaks are local, epidemics are regional, pandemics are global. The fear has been that the regional spread would lead to a global set of currences. Putting the genie back into the bottle is not an option unless we can develop a vaccine and make it available everywhere Ebola exists. And if we do that, the virus will likely evolve into a new variant. It is, after all, what they do. Well … I’m impressed with the reach of Remedia. There are 32 comments and the article itself was reposted in at least four places, with praise. I’m delighted with this response and thanks to you’all again for your support and interest. I’m currently on another article about Ebola for another journal. But … as the epidemic diminishes, it’s perhaps time to thing about a “lessons learned” and a “practical focus” for the next epidemic, one that uses these comments to craft a focus. I’m delighted that Deszy and others continue to find this useful. A later paper on mapping Ebola was published in Disaster Medicine and Public Health Preparedness, a Cambridge journal. I don’t think it’s open access, however. I’m currently working on another on the mapping as a field tool in public health and epidemiology. If the journal permits, I’ll post it here, too. But the Remedia staff did a great job on getting this article up, and out in a timely fashion. My thanks to them. Reliability is the ability to say that a piece of information is undoubtedly valid. Validity can be based on a number of factors, but the most common of these factors is the ability to verify. The article on “justifying belief” draws the user to the possibility that they may have wrong what they consider to be accurate. In such regard, there is the allusion to a source; where the information is gathered. The conviction that such a source is indeed accurate should be unquestionable. The article points to another category of reliability by mentioning that “true belief” is what should be added to the reliability to constitute knowledge. It thus decries the need for evidence in support for a particular notion or belief. The internalist view on life is that memory is the main asset as far as factual recognition is concerned. The ability to note down or document is regarded as trivial. One can only grasp the power of the mind when all records are distorted, lost or sabotaged. This notion is nonetheless with disregard to the need for record since not all memories have the ability to recall accurately. The cognitive ability of memory is a difficult phenomenon to comprehend. Despite being virtually inaccessible, the mind can recall facts for decades without the trouble of having to recite them. These are aspects that leave gaps in his philosophy. Names and other tenets of urgent data are stored in a mode that they can be called to mind as soon as possible. This presents the philosophy that knowledge from memory is but an abstract claim (Nagel, 63). The externalist opinion on facts is also substantial. The need for records is critical since the memory cannot grasp all concepts on earth. It is necessary for people to have all the necessary records that can suffice to keep information about an experience or thought. Great mathematicians, philosophers and scientists wrote books and manuscripts that have helped the development of science. With regard to this view, it is important to evaluate the fact that at times recall is necessary when it comes to fostering relationships among human beings. It is hence critical that human beings maintain records in whatever way they can for the advancement of another genration. That notwithstanding, it would also suffice that there be a standard of accepting or rejecting records as proof, based on their validity. This makes written information more powerful than what has been stored in the memory. The ability to verify and quote or cite makes the difference. In Goldman’s article of justifying belief, there are aspects of the theory that meet the eye. First, is the fact that a belief is just that, ‘a belief’. It is often without basis but of strong conviction. This is the reason why religions tend to have powerful doctrines and rules based on myths. It hence becomes critical to draw the line and even distinguish where necessary. Based on this, there is a requirement that even as one consistently develops these thoughts, there be constant verification from some source. However, there is a defense for belief on grounds that what has guided many cultural dispositions over time has been a belief that may not really be true. That said, there is a need to distinguish between belief and verified fact. One should hold more water than the other based on the context and the role such a phenomenon plays in life. Nagel, Jennifer. Knowledge: A Very Short Introduction. , 2014. Print.